I will be reporting in English from the Emerce Day in Rotterdam on September 17th. Part of the deal is that I tell others about the conference - and frankly I don't need any prompting to do so. The programme seems to be building into one of the best one-day events for a long time - a sort of Le Web, Picnic and TED rolled into one. Emerce is a monthly magazine that does a good job to dig through the business of the web with a lot of original research. They also have a vibrant on-line community too. Looking forward to seeing Douglas Rushkoff, Hans Rosling and Gary Vaynerchuk in particular. Douglas recently published a new book Life Inc which I bought on audible which I enjoyed and can recommend. 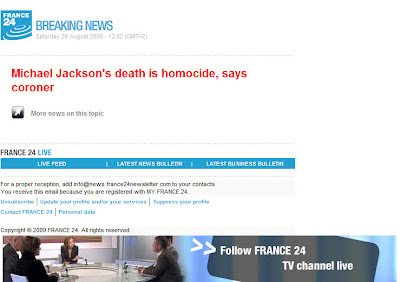 First email sent out to everyone on their breaking news list had an interesting spin on the Jackson inquest. I have to laugh at this. A conference popped up on the UNESCO website in Paris and a couple of broadcasters in Ghana and Benin asked me to find out more. I filled the form in on the site and after a week got this back from someone who seems to be working at 6 am in the morning. Clearly, they haven't got a clue what they're doing. Well I had questions as to why what they said in the e-mail bears no relation to what they are advertising on the website. But then I thought why bother? UNESCO doesn't understand emerging media at all and keeps proving it time and time again. This conference doesn't look as though its going to help anyone. Nice collection of facts seen from a US perspective and viewed through a rather rosy set of sunglasses. But still. Not sure the Royal College of the Arts Industrial Design programme are really the first to use conductive body paint (carbon particles in a water soluble paint was around in the 70's) but the way they did this was certainly creative. The making of video is below. More details on the paint at Bare Conductive, though apparently they are not selling the conconction. Having tangled with customer service of various companies a couple of times, I have been tempted to get my own back through a campaign on Youtube. Remember the Kryptonite bike lock that could be opened with a ballpoint pen? But this recent video by Canadian singer Dave Carroll gained him an audience of over 4.9 million on Youtube, plus several networks like CNN and BBC doing interviews. Basically, United Airlines in Chiacago bust his guitar while in transit. What was worse, while they were sitting in the plane, the musicians could see the groundstaff outside the plane throwing their instruments around. United Airlines staff showed a total lack of interest. Dave tried for 9 months to get compensation. Then he gathered friends together to peform his song about United. The "making of" shows they had a lot of fun. I’ve receive many “why the Mexicans” questions and the answer is simple. The music and feel of the song reminded me of a combination of old Marty Robbins and early Elvis tunes. Since “Fun In Acapulco” is my favourite Elvis movie, and in it he had a mariachi back-up band, I thought it’d be funny to have a mariachi group in this video. Because I didn’t have a budget for full mariachi outfits I simply bought sombreros and moustaches and the Amigos were born. There were various stories last month that the song had caused a massive drop in United's share price. I think that was overstated - the whole airline industry is in a slump right now. But the mayhem this must have caused in the marketing and PR departments of United is priceless. Carroll has since put out a statement challenging United to compensate a charity of their choice rather than pay him the damages directly. I cannot believe why United hasn't just jumped at the opportunity to put things right. I guess the decision makers are out to lunch on this one. Song 2 and 3 have yet to air on Youtube. Labels: "United Airlines" "Dave Caroll" "Breaks Guitars"
I love these characters, made famous by French television I believe with their version of the Lion Sleeps Tonight. Just put "hippo and dog" into Youtube and you'll see how creative kids in the audience have downloaded and remixed the images to fit other songs in other languages like punjabi. I am surprised these characters haven't turned up in the Anglo Saxon world. They have been used to sell chocolate, but also teach children to clean their teeth. Bit of fun to make it viral. And one more which doesn't want to be embedded. So why haven't the original creators taken this to the next level? 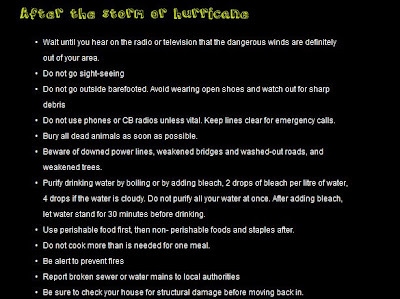 Perusing the lime website in the Caribbean (lime is the new name for Cable & Wireless in the region, I saw this list of things to do after a hurricane has passed. Putting bleach into the water to sterlize it reminds me of the great development in water purifcation demonstrated by Michael Pritchard at TED a couple of weeks back. Personally, I'd alaways prefer to drink from Michael's Lifesaver flask than the bleached stuff. Google's abortive love affair with radio is over. Thank goodness. I would argue that by getting in to the business of selling radio ads, Google was never really into the content side of radio. It was trying to do Adsense on commercial radio stations, becoming a threat to the radio sales dept of the radio station. It had no clue in this side of the business. Sounds like e-Bay and skype. Radio urgently needs a Google-like service, being able to find interesting audio in an i-Player like environment. Radio is still struggling with the point and dial interface. Most radio station websites are a joke - a schedule and a button to listen live. Millions are being spent on radio programmes which are only available when on the air and difficult if not impossible to find later. Far from being a cheap medium, in developed countries its becoming a very expensive way to share an idea. Google's radio automation software business has been sold to the US company called WideOrbit. They are now owners of the Maestro and SS32 automation products. But this is a very crowded market in an industry that has very little money at all at the moment. Don't they get problems with people giving their products a wide orbit? Freedomfone Zimbabwe from Jonathan Marks on Vimeo.